People prefer to buy what they see. This may be obvious, but a lot of funeral homes seem to ignore this fact. And people prefer the "easy" way over the "hard" way. Many funeral homes miss the boat on this as well. Families doing business with funeral homes have two unique challenges: first, they must make decisions fast (usually within 1 to 3 days) and second, the decisions they make often involve multiple family members. The easier you make it on families to see and buy your services, the more cases you will close. A mobile-app with an Arrangement Room and a Selection Room makes it easier for families to see your products and to buy your products. Families want information first hand and fast. Each person wants to see your products for themselves. And when families are ready to buy, you want to make it convenient for them to do so. 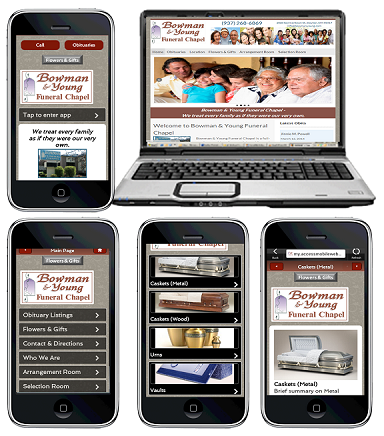 We set up funeral homes' mobile apps so that it is easy to see your packages, caskets, urns and vaults. And we make it easier for families to purchase your services by giving them the ability to buy your services as a package or individual items right from a mobile phone. Suppose you're talking arrangements with a family, either in person or over-the-phone, and they don't sign and pay right then and there. In that situation, you could say "If you need more time to make your decision, I want you to know that all of our packages, caskets and vaults can be seen from mobile phones. And once you decide to use our services, payments may also be done from your or anyone else's mobile phone. To view our offerings from the convenience of a mobile phone, just use the internet browser on your mobile phone to go to our website or text the word 'Bowman' to 72727. If anyone not here needs to be involved in the arrangements, they too, can use our mobile app to view selections. And if you have more questions, just tap your phone to call us. At Bowman and Young, we want to make this difficult process as easy on your family as possible." If you are competing with another funeral home in situation that doesn't have these conveniences, or dealing with a shopper, don't you think your chances of securing the case would be much better? The more you keep families focused on your funeral home's products and services, the more business you will get. 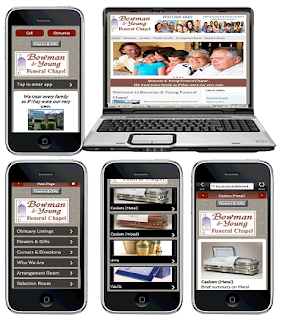 To see this in action, take a look at Bowman Young Funeral Chapel in Dayton, OH. Here is a link to use from your mobile phone, http://bit.ly//1igMSPz. Or text 'Bowman' to 72727.